With a knowledge of the Italian language, it still makes me chuckle that ‘biscotti’ in every other language refers to this particular type of sweet treat, whereas ‘biscotti’ literally translates to mean ‘biscuits’. The Italian call these type of crunchy biscuit cantuccini which I think sounds much more exotic and enticing, don’t you agree? Nevertheless, I’ve stuck with the anglicized name for these biscuits to avoid confusion and to encourage as many of you as possible to make them for yourself! I really got into making biscotti several years ago, playing around with flavours, drizzles and thickness. I’d make them as gifts, wrapped up with a ribbon and bow. Oh, how I hadn’t realized how much I’d missed them! Vegan ones are hard to come by in the supermarkets so I just had to make my own. With the festive season upon us and Christmas just around the corner, what better way than now to experiment and create something deliciously Christmassy! 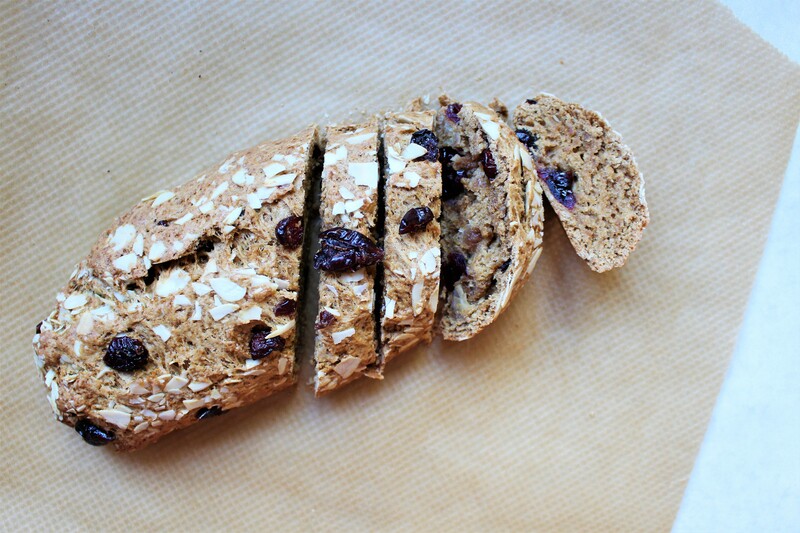 There is so much to love about these Orange and Cranberry Almond Biscotti! They are super crispy like a good biscotti should be, they have an amazing almond aroma and are the perfect treat for dunking. They are packed with juicy fruity cranberries, slivered almonds and caramel-like coconut sugar. Don’t worry that your biscuits look darker – that’s the golden tones of the coconut sugar – although you could use ordinary sugar if you prefer a lighter colour. You can also play around with the dried fruits and nuts in here as it’s a really versatile recipe. At first, I was a little daunted by making vegan biscotti as I didn’t know how they’d hold together and whether they’d be crispy enough. But, rest assured, you wouldn’t even know they have no dairy or eggs in them. I actually think this is much easier than my previous bakes as it requires minimal kneading and rolling into a log. Like any normal biscotti, it requires a double-bake to ensure the crispiness. The only slightly fiddly part is cutting the log into slices. The trick is to let it cool slightly, apply gentle pressure with your hands on top, use a sharp serrated knife and remember that these look better with a rustic or ‘home-made’ appearance. Plus, chocolate hides a multitude of sins. I drizzled over a deliciously rich dark, orange and goji berry chocolate bar from Doisy and Dam – which was actually the inspiration behind these orange-zested, berry-spiked cookies. 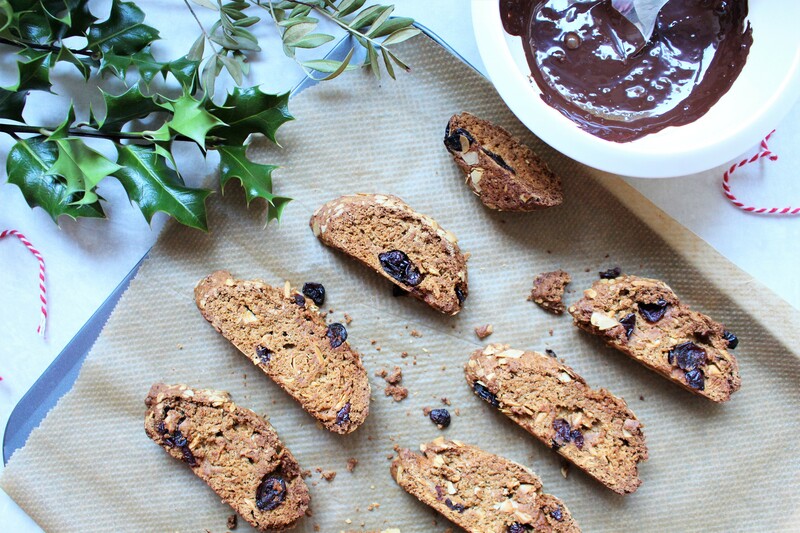 Drizzled, dunked or slathered on, these biscotti are perfect with chocolate over them. “I’d enter you into the Great British Bake Off for these” a note of appreciation from a workman. “Just to say those biscotti are the nicest ever” a little text message sent from my Dad. I hope you’ll enjoy these Orange and Cranberry Almond Biscotti – perfect for getting you into the festive mood. Chocolate covered and nutty biscotti, these vegan and refined sugar free biscuits are perfect for dunking. 1. Preheat the oven to Fan 150-170*C and line a baking sheet with parchment paper. 2. Stir together the flour, sugar, baking powder, salt and orange zest in a bow. 3. In a small bowl stir the melted coconut oil, almond milk and almond extract together until combined. 4. Add the wet mix to the dry mix, stirring with a spoon and then bring the mix together with your hands. Knead until fully combined and add in the almonds and cranberries. 5. Roll out into a log shape about 12cm long and place on the baking sheet. 6. Bake for 30-35 minutes, until the top is crisp and firm to the touch. Remove from the oven (leave the oven on!) and allow to cool for 10 minutes before using a sharp serrated knife to carefully cut the log into 1-1.5cm thick biscotti. 7. Place each biscotti face down and bake for a further 10 minutes. Flip them all over and bake again for 10 minutes, until crisp and crunchy. Allow to cool fully on a wire rack. 8. Drizzle or dip each biscotti in the melted chocolate, sprinkle with extra almonds and allow to cool before storing in an airtight container. I’d love to see if you make my recipe for Orange and Cranberry Almond Biscotti so please tag me in your bakes – I’m @nourishing.amy on Instagram and use the hashtag #nourishingamy. Leave your thoughts below, too! You can also find me on Twitter, Facebook and Pinterest – do say hi! Happy holidays. These look so yummy! This is making me want biscotti!